The full PR blurb mentions “traditional” 6 times, they seem keen to underline that it’s traditional. Info: Chill Filtered. 80% Peated malt 20% Unpeated malt. Nose: There’s quite a sprightly young smell to this, lots of distillery character. There’s some nuts, some youngish oak and some caramel along with small sweet puffs of smoke. A real cereal barleyness comes out given time to breath a little. Palate: It’s thin to medium on your palate with sweet caramel oils and an ashy smokiness which I am quite enjoying. There’s a background of nuts and a pinch of spice. Finish: Sweet, more smoke becoming apparent and a grassiness coming out and sticking around for quite a long time. Thoughts: It does feel a little young, but that’s ok, it works well with the sweet smoke. It describes itself as a good introduction to peated whisky, and I don’t disagree, it’s at a price point that shouldn’t put too many folk off, and it’s a good one to start with. I rather like it! Available: In shops shortly (Morrisons and Tesco amongst others). £29.99 RRP. Info: First released in 2007, and now to be discontinued. This is not chill filtered so it ticked the boxes of malt geeks for many years. Colour: Yellow gold, almost exactly the same as Legacy. Has colour matching with caramel been used to keep them the same? Either way, caramel colouring, tick. Nose: A slightly more complex nose than the Legacy, I don’t know if that’s because it’s older or not, they’re both non age statement whiskies. It could be that the extra alcoholic strength is carrying more flavours through. It’s quite a hearty nose, lightly peated sweet smoke puffs with heather and honey. Similar but not the same as Legacy. Palate: Fairly thick mouthfeel which covers your palate nicely with flavourful barley oils. Some young oak pokes it’s head out here and there but is mostly masked by some gentle spices, smoke and sweetness. Finish: Warming, thick and long on your chest, there’s ashey smoke and malt which continues on for a while. Thoughts: We’re talking smoke and gentle peat, none of your Islay TCP here, it’s a gentle giant, and a whisky I’ve drunk for years with a big soft spot for; it’s well priced with a presentation (non chill filtered) that keeps me happy. Overall Thoughts: “The only traditionally peated Highland single malt whisky”… It’d be great to get that statement cleared up. What does ‘traditionally peated’ actually mean? If it means the barley is malted on a malt floor and peat dried in a kiln at the distillery (which would be quite traditional), then it doesn’t seem possible as the distillery doesn’t have malt floors or kilns. Therefore it must simply just mean the barley is peat dried as it would once have been back in the olden days before smokeless barley air drying was possible using electric heaters. The barley therefore must be peated by the maltsters who provide the malt to the distillery… Who are more than likely the same maltsters that provide ‘traditionally peated’ malt to other Highland and Speyside distilleries such as Tomatin, BenRiach and others. Tomatin is a Highland distillery which produces a peated malt… meaning that Ardmore is not the ‘only’ one. Anyway, we’re talking semantics, I’ll move on. Mentioning Tomatin here… they also have a ‘Legacy’ branded whisky in their range, and have had since early 2013, so don’t go getting muddled (Tomatin’s Legacy is around £5 less, and has more ABV mind you). It seems a retrograde step to abandon the old Ardmore Traditional Cask bottling (which was quite well respected); are they trying to increase revenue, change stock control due to increased demand, or just realigning their range under new owners? The whisky itself is perfectly good and enjoyable, but I will lament the passing of the old bottling that’s for sure. 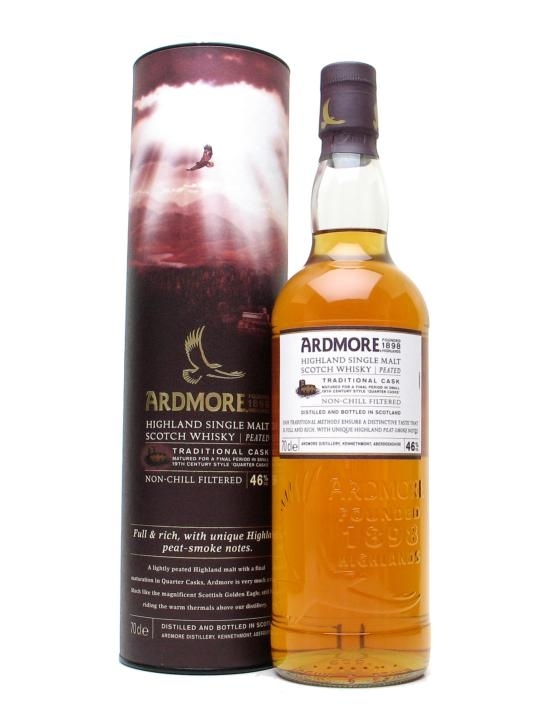 It may sound like I’m being a little down on Ardmore here, I’m really not trying to be, I’ve always had a soft spot for Ardmore, it was the first peated malt I ever had, and was one of the whiskies that started me on my malt journey. I’ve had a bottle on my shelf ever since. 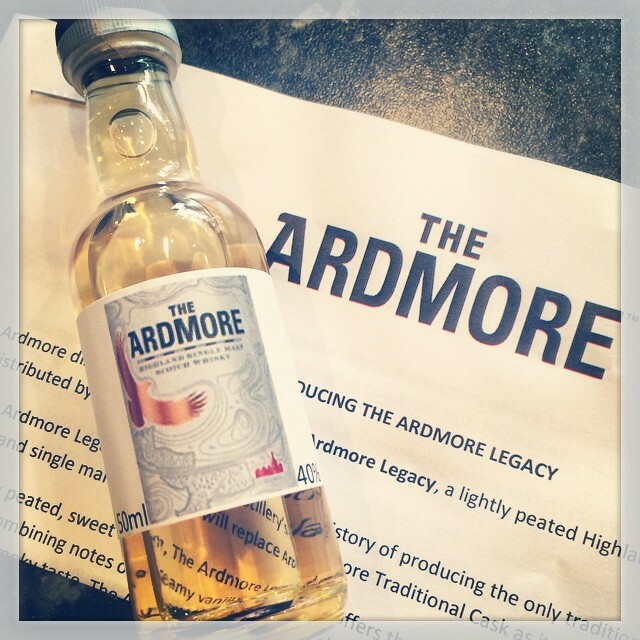 In summary… The Ardmore Legacy is a perfectly good whisky, and a great starters peated malt. However it’s a backwards step to cut the ABV by 6% and charge the same, or more for it. I may well still keep a bottle of it on my shelf, once my stocks of Traditional Cask have run out (I’ll be getting another before it’s all gone!). Thanks to The Ardmore for the sample. This entry was posted in News, Review, Whisky and tagged Ardmore. Bookmark the permalink.